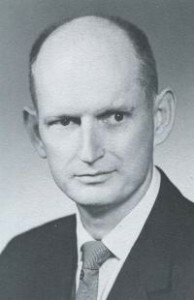 Truett Coston was born in 1911 in Lufkin, Texas spent his childhood there before leaving to attend the University of Texas, where he received dual degrees in English and Architecture. During World War II, he worked for the Austin Company designing war plants, which brought him to the Sooner State in 1942. He liked the flat plains of Oklahoma so much that he decided to settle here after the war and, in 1945, he formed Coston & Frankfurt (later Coston, Frankfurt & Short). For 20 years, Coston designed modern buildings throughout the state before leaving in 1964 to work for Bethlehem Steel in Pennsylvania. He finally settled in California, where he died in 1997. The firm he started here in OKC remains and is now known as Frankfurt, Short & Bruza.